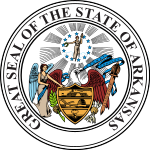 The 1956 United States presidential election in Arkansas took place on November 6, 1956, as part of the 1956 United States presidential election. Arkansas voters chose eight representatives, or electors, to the Electoral College, who voted for president and vice president. Arkansas was won by Adlai Stevenson (D–Illinois), running with Senator Estes Kefauver, with 52.46 percent of the popular vote against incumbent President Dwight D. Eisenhower (R–Pennsylvania), running with Vice President Richard Nixon, with 45.82 percent of the popular vote. ^ "United States Presidential election of 1956 - Encyclopædia Britannica". Retrieved June 10, 2017. ^ "1956 Election for the Forty-Fourth Term (1961-65)". Retrieved June 10, 2017. ^ "1956 Presidential General Election Results - Arkansas". Retrieved June 10, 2017. ^ "The American Presidency Project - Election of 1956". Retrieved June 10, 2017.